Are you ready to remodel your master bath? If you’ve decided to renovate the master bath, you might not know where to start. Between establishing a budget and determining a color scheme, there doesn’t seem to be enough hours in the day to plan a successful remodel. Your Project Loan can help you with the financial aspect of your project, but it’s up to you to gather inspiration and plan appropriately. 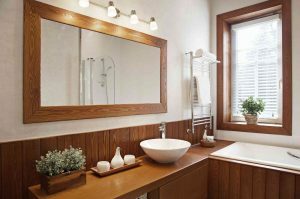 Discover how to plan a master bathroom remodel with the following tips! It’s important for you to have a firm grasp of what you want and out of your remodeling experience. Look to helpful websites like Pinterest, Houzz, and HGTV for remodeling inspiration and file away your ideas for your initial consultation with the contracting team. An experienced contractor can help you transform your outdated bathroom into a luxurious space. Whether you’re looking to remodel a 200 square foot master bath or a half bath, you need a contracting team that’s going to listen to your needs and can produce the best results. Consult friends and colleagues for references, and do your research online before committing to a team. As a rule, it’s recommended that you interview two to three contractors before you make your decision. Whether your project is large or small, you family is going to have to deal with a number of inconveniences until it’s complete. If you only have one bathroom in your house, ensure that you have a plan for your family during the renovation project. If you have more than one bathroom, ensure that you make the necessary arrangements to your schedule to accommodate all members of your family. This entry was posted on Friday, February 2nd, 2018	at 12:20 pm	. You can follow any responses to this entry through the RSS 2.0	feed. Both comments and pings are currently closed.